Time to see off the bedroom tax! 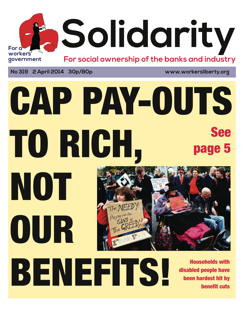 Cap pay-outs to the rich! March in March: Australian indignados? Welcome China's unions back into the family? Russia's ruler Vladimir Putin has demanded that Ukraine adopt a federal constitution. The move is a gambit to gain Moscow more leverage in Ukraine. Ukraine is diverse, but it is a distinct nation, with a right to independence from Russia; and, despite Russian claims, it does not divide neatly into two sectors. The west is poorer, heavily dependent on remittances from Ukrainians working abroad, and mostly Ukrainian-speaking: it was not part of the USSR until 1939. To mark the first anniversary of the bedroom tax (1 April), the BBC commissioned an investigation. It found 6% of tenants previously claiming (and now no longer receiving benefits for spare rooms) have moved. 28% of tenants affected have fallen into rent arrears for the first time. The amount “saved” by the measure is at least £140 million less than predicted. The official regulator for the energy industry, Ofgem, reported on 27 March that suppliers’ retail profits — from selling energy to households and businesses — had risen to £1.1 billion in 2012 from £233m in 2009. No austerity for the energy bosses! It also found “a pattern of suppliers raising prices more rapidly and to a greater extent in response to an increase in costs than they reduce prices in response to a fall in costs”. Workers at the Ritzy Cinema in Brixton, south London, have voted by an 85% majority to strike to win the London Living Wage. Ritzy workers have waged a long-running battle for the pay increase, but Picturehouse Cinemas, the chain that runs the Ritzy, has so far remained intransigent, to the point of banning local publication Brixton Bugle from the cinema for running an article supporting the workers. The workers are members of BECTU, which represents workers in theatres, cinemas, and the television industry. Car workers suffered another blow on 25 March, as Honda announced a plan to cut 360 permanent and 160 agency jobs from its Swindon plant. The actual job losses suffered could be as high as 500, as businesses elsewhere in Honda’s supply chain are hit by the central cuts. Probation officers and criminal solicitors struck at the end of March, in a dual protest against the outsourcing of 70% of the probation service and a huge cut to the budget for legal aid. Probation officers struck on 31 March, while solicitors struck for two days to 1 April. On 26 March the coalition government voted through a law to “cap” welfare benefits for future years. Most Labour MPs voted for the “cap”. Only 13 rebelled. We should instead “cap” the huge pay-outs being made to the rich. Inequality in Britain has been rising since 1979, and is now soaring. Real wages, on average, are still going down, despite all the talk of economic recovery. Discussing why the old Italian socialist movement had failed so badly in and after World War One, Antonio Gramsci saw it as having been dominated an oratorical culture, lacking the theoretical depth for which a stronger stream of written debate would have been needed. Registering the difficulties facing the internationalists in Germany in World War One, Rosa Luxemburg noted ruefully that her comrade Franz Mehring was interested only in literary efforts, not in getting out onto the streets and into the factories to agitate by word of mouth.